With our newly promoted characters, it’s time to tackle Mt. Gulg and the fiend of fire. 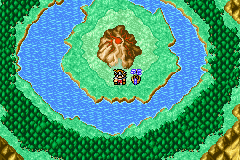 To get to the Mountain (I should probably say volcano) hop in your airship and return to Crescent Lake. From the city, head directly west and just a bit north. You can’t miss it. This dungeon could have been dangerous if we had proceeded here directly after finishing the Cavern of Earth. However, since we took the time to class change, we should actually have fun. The first floor of Mt. Gulg is very straight forward. The staircase to the next floor is in the northwest corner. You’ll probably notice the lava on the floor, as when you walk over it, you will lose HP. It’s nothing to be concerned about, as the HP loss is minor. An easy way to keep you HP up is to have one character (usually the white or red mage of the group) use the Heal Staff in every battle. Enter a cave at the base of the Volcano? Hell no, we’re going straight in the top! The second floor is not as easy, if you want all the treasure that is! If you simply want to get to the bottom of this dungeon, proceed directly west. You will soon see the next staircase. If you want to collect the treasure, enter the door to your north and proceed through the maze. Using the map of this floor will make things much easier. After collecting the treasure, go down the stairs. Unfortunately there is no treasure on the third floor. Move to the east to find the next set of stairs. The fourth floor isn’t much better. 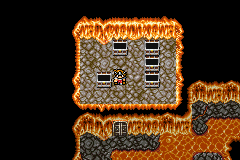 At least when you are walking on lava, you don’t have any random encounters. The fifth section requires still more walking and more lava surfing. There is no treasure here, so head south at every opportunity, and then head west. Join us next time on Hoarders when we confront the Light Warriors about their compulsion to collect largely useless treasures. Section six has a good bit of treasure. You’ll want to use the map to plan your route. The item of most lasting significance is an Ice Sword. It is one of the more powerful weapons you can collect at this point in the game (not to mention is does wonders on fire based enemies) Once you have finished collecting everything you want, it’s time to head to the final floor. Despite the vast layout of this floor, there is only one treasure chest. 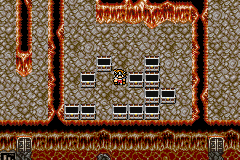 It is in a room directly west from your starting point, and contains Fire Armor. Once you have it, proceed to the southwestern chamber and prepare to face the Fiend of Fire! Is it a requirement that all treasure chests make a pilgrimage to Mount Gulg once a year? 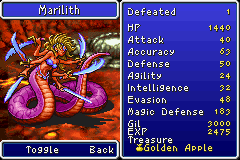 Surprisingly enough, Marilith is not weak against ice spells. She’s not strong against fire spells either, so have your mages blast away with the most powerful spells in your possession. Have all of your melee characters attack, making sure to cast Haste on them first. Heal when necessary. You shouldn’t have too much of a problem here.